The lightning symbols at the back of the stage poke through the blue filled haze of the smoke and lights, while at the same time the Wendy Carlos electronic version of Beethoven’s Ode To Joy plays through the auditorium. It’s quite impressive and very Germanic, and one wonders of it in terms of the flirtation with pseudo Nazi imagery that Bowie had been accused of. It’s quite scary in its similarity to the kind of spectacle that has been paraded by the Third Reich during the thirties. And so, Ed Blaney arrives and bangs straight into Ziggy period Bowie dressed as Ziggy Stardust. He looks a bit old really, as Bowie was cute, young and pretty. The music is ok though, and the band are all professional musicians, and Ed seems to have employed the three guitar trick here. For those unfamiliar with the latest Bowie tribute band Shenanigans, Tony Visconti, the original Bowie arranger and producer for his last series of gigs covering Bowie material, has used three guitars in order to create a big sound on stage. It was so good it seems that Ed’s nicked the idea. So, they run through the classic Bowie tunes of the Ziggy era, hang on to yourself it is really good, the interplay throughout with the guitarists is excellent. It’s funny, as they appear chalk and cheese, one looks like he is from a Deep Purple cover band, the other looks like he should be in the Stray Cats, but both complement each other really well. Other good songs are Drive In Saturday and Space Oddity, which has the Visconti arrangement. It’s during the second half that the band begin to come into their own. It starts with synths impersonating train sounds. This is like the beginning of the Station To Station gigs in the seventies. This is quite impressive as it builds up to when the band start to play the song Station To Station, which is an excellent version and one my favorite Bowie tunes. This time Ed is wearing a suit and has dispensed with the Ziggy wig. He looks quite cool now in a Diamond Dog suit, blue shirt and braces. So in the end he encores with some more early stuff and apologizes for not doing anything off Blackstar (the last album). Yes, I like Blackstar. We are not doing it tonight he says to a member of the audience. Funnily enough they play it as we leave. I suppose that’s a sop to us. 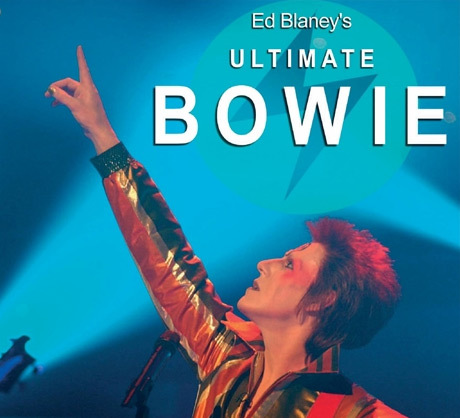 So what’s the verdict on Ultimate Bowie? they are actually pretty good, with the second half being better. I thought China Girl was really goo but the Ziggy stuff needs to be fiddled with perhaps. Maybe Ed should start to check out Bowie’s back catalogue post Scary Monsters. There are nuggets awaiting you Ed. Perhaps the audience want the hits. And, so finally. The Epstein Theatre seems to have this weird thing going on now where the performer comes into the auditorium directly after the show to speak to the fans. Elfin Bow did it the last time I was there. It’s a bit weird but people seem to like it. The old days of doing a show and disappearing into the night are now long gone. So I leave the auditorium only to come face to face with a post gig Ed and a bit sweaty. He looks at me,and I quip, hey you look just like that guy that was on stage a minute ago. He looks back gobsmacked, I smile and shake his hand. Great show I say. And yes folks I really mean it.